The house is a custom built cedar, two story walk-out, with the lower level walking out on the lake side. Each floor has a large, comfortable living area in the center, each with a beautiful view of the lake. The first floor has two bathrooms and a large master bedroom and den with a fold-out couch. There is a large, comfortable living room with beautiful windows and a cedar vaulted ceiling. Also on this floor is a nice kitchen and dining area, opening up to an outdoor deck. The second floor, in addition to the living room, has three bedrooms and two bathrooms. It opens out to a deck and walkway to the dock and lake. Leland sits between Lake Michigan and North Lake Leelanau, a beautiful and large inland lake. Our home is in a private location on the west shore of North Lake Leelanau - great for swimming, boating, kayaking, or just sitting on the deck and enjoying the great water views. Leland and Lake Michigan are just a short walk from the house. Leelanau County, which is the 'little finger' of the lower peninsula of Michigan (in the northwest corner), is an exceptionally beautiful place and a wonderful place to visit. It is a mosaic of beautiful cherry farms, vineyards, wooded hillsides and spectacular Lake Michigan shoreline and beaches. It is also the home of the Sleeping Bear Dunes National Lakeshore which contains miles and miles of beautiful beaches and spectacular sand dunes. In Leland you can enjoy shops, many nice restaurants and historic Fishtown. From Fishtown there are charter fishing trips available, or a ferry service to two islands (The Manitous), part of the Sleeping Bear Dunes National Lakeshore. There are many other wonderful towns in Leelanau County to explore. There are 12 wineries in Leelanau County, and many more in the neighboring Old Mission Peninsula. Just south of Leelanau County is Traverse City, Michigan, home of the National Cherry Festival, the Traverse City Film Festival, and the Epicurean Classic. Overall, this is an amazing and unique place to visit. My parents built this waterfront home in the resort village of Leland in 1990 so that our family could have a place to gather in the summer. It is beloved by all members of our family as a relaxed and beautiful place to get together. 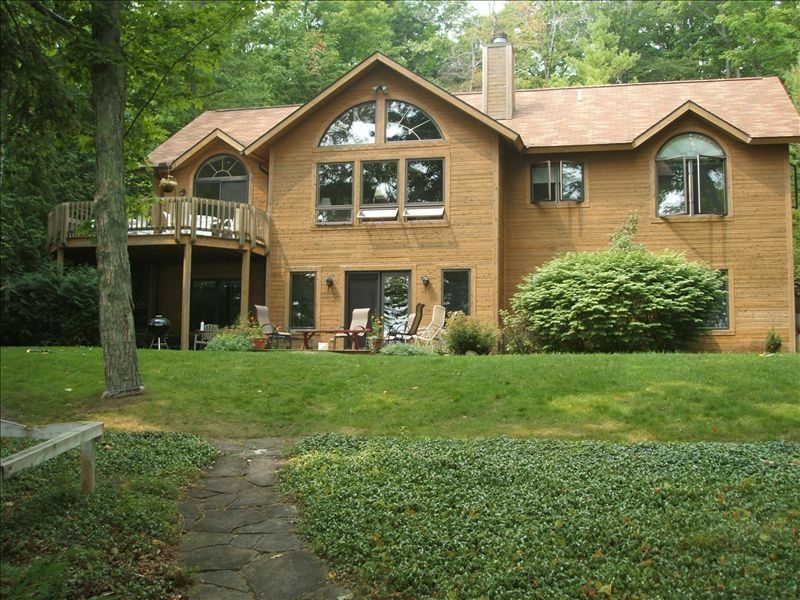 This property contains 90 ft of Lake Leelanau shoreline. Swimming is great, and there is a nice dock area with chairs for relaxing by the water. This home is amazing. So spacious and lovely. The homeowner has thought of everything that you could possibly need to make you feel completely at home. The views are stunning! We have been coming to this area for "Couple's Wine Weekend" for the last several years and this place is our favorite by far! Very spacious, clean and convenient location just outside of "Fish Town". The owner is very professional and very hospitable too. Had all the cooking utensils that are needed too. The view is beautiful right off the lake. We unfortunately arrived after the dock was removed, but crystal clear water! Perfect spot for a couple familes with kids enjoying a Northern way of life in the Summer or for a fun weekend getaway with couples!